It really has been a marathon of video watching and at this point I'm down to the final 18 Moho tutorial videos that came with my software purchase. 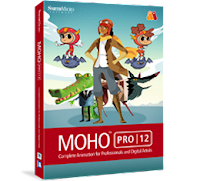 These videos focus specifically on the new features of Moho Debut and Pro 12. I'm eager to get through these as quickly as possible so, let's get straight to it. You'll find my previous post here. The list below are the tutorial titles that I've completed for this post and my summaries of each follow after that. Each title is linked to its corresponding video on YouTube. The first video in this batch is the only video for Moho Debut, the lower priced and fewer features version of the software. It's a basic run through of what's new that's common to both the Debut and Pro versions. Interesting to watch if you've gotten this far but doesn't go into any new feature in any great detail. 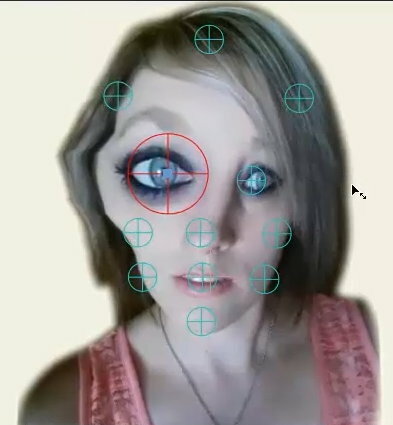 Of most interest here is the new pin bones which are great for distorting parts of you image. New GUI video is, as you would expect, a quick run down of what has changed with the user interface. Highlights include being able to change the GUI color scheme, bolder and more colorful icons, the redesigned and better integrated library and new and improved layers panel. The New Library video is a more detailed look at Moho's more integrated and stable content library. You'll find all your purchased content pack in the library and can do many other things to better organize your animation components. There's nothing that exciting to show but if you ever need a refresher on what the library does, this video will help greatly. Like the New Library the New Layers Panel tutorial runs through all the new features of the layers panel. You'll probably be using the layers panel a lot so it's worth keeping this one close by as you're familiarizing yourself with the software. Again there's nothing spectacular to show as it's just a straight forward run down of what you can do with all the buttons and menus. The Bone Enhancements video runs you through a setting called 'ignored by inverse kinematics' and how it can fix a specific bone issue caused by linking additional bones to an existing bone. Although I understood the steps, it's really one of those settings you'll probably rediscover once you're more familiar with construction bone rigs. Other new features covered included the ability to color code bones and to have the bone names auto filled into the Action naming boxes when creating bone actions. 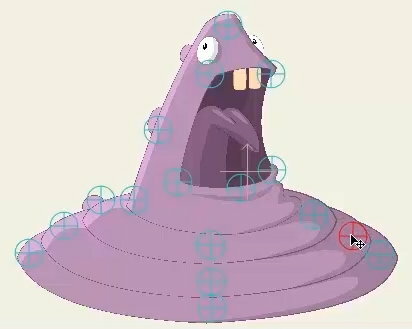 Pin Bones is a more detailed look at the new Pin Bone feature and runs you through two examples, one using a vector character and the other using a photographic image. Pin Bones basically allow you to warp, distort and move a specific point on any image. Pins can be moved, resized to affect a larger or smaller area as well as be rotated too. I'd add this video to your list of ones to go back to as pin bones seem very versatile and something you may end up using a lot. The Auto Freeze Keys video is useful to know as it's a setting that will automatically place key frames for every bone in your rig every time you change the position of any bone within the rig. This stops the creation of 'floating bones' where you key frame a bone to move, but you haven't placed a key frame for that bone for quite a number of frames, causing the movement to begin from the last key frame instead of from a later key frame that you forgot to set prior to making the adjustment. (If you can follow that last sentence then good for you but once you watch the tutorial you'll know exactly what I mean and why Auto Freeze Keys are probably your new best friend). SVG Import Export is new to Moho and this tutorial demonstrates how you can export your vector graphics as SVG files, take them into another Vector Software, make changes and then Import the updated image back into Moho. It's useful to know but not an essential feature. Personally I'd use it to either export my art for other purposes or create my characters in other vector software then import them in to Moho as SVG files. So that's the run down of all the new features common to both debut and pro versions of the tutorials. This leaves just ten more tutorial videos taking you through the new features of Pro only. Just looking at some of the titles like Smart Warping and Realistic Motion Blur, it should make for an interesting final post in this series. No problem, glad you found my posts useful. Don't forget to read part 12 - the final installment. I'm also updating all the posts in the series and linking to the videos if they exist online.